A Bit about Me ! Just to lay it out there, I really like “reality” tv. Particularly reality competition television. I don’t care for shows like The Real Housewives… or Jersey Shore, just so you know where I stand. My big three have always been Survivor, The Amazing Race, and The Biggest Loser. As I eagerly await the return of all these shows for the Fall season (The season pass for Survivor:South Pacific has already shown up on my Tivo, woohoo! ), there were actually a few summer shows that caught my interest. I will go ahead and say that I am watching Big Brother and although it’s not on my favorites list really, it’s more like a guilty pleasure kinda thing. I kinda half-watch the episodes and keep up with the feeds via social media. Expedition: Impossible kinda let me down. It looked really cool, and probably was really cool…it just didn’t hold my interest. I tried to keep up with it but there was nothing really there that hooked me and I fell behind watching the episodes so far that I just deleted them all, and I didn’t feel bad about it. I gave The Bachelorette and Bachelor Pad a small chance just for the hopes of looking at some hot guys and I deleted both season passes within 5 minutes of turning on the first show. The over-hyped drama in the ads alone made me a bit nauseous. Eye candy alone is not enough reason for me to put up with all that mess. But there were a few shows that held my interest and definitely surprised me. I hope they all come back next season as I’ve become a fan. 3. 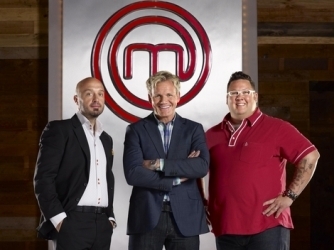 MasterChef – Apparently this show has been on a few seasons already and I totally missed it. Maybe it’s because of the complete boycott I placed on watching Hell’s Kitchen or Kitchen Nightmares, because of Gordon Ramsey’s overuse of his voice and temper. I decided to give this show a try and I’m glad I did. I found a more sedated and surprisingly charming Ramsey. The show was a little laid-back and low-key and perfect for me to watch. I’ve always been a fan of Top Chef and since the beau and I just have basic cable I’ve been missing my fave cooking competition show. This fit right in to the mix and renewed my faith in Ramsey. 2. 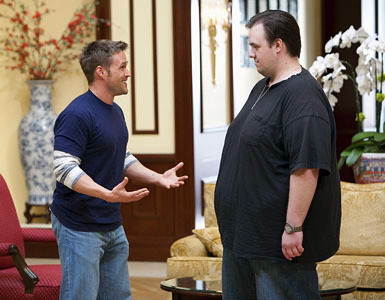 Extreme Makeover: Weight Loss Edition– I’m a big fan of The Biggest Loser so I wasn’t sure what to make of this show when I first saw the previews for it. Not only do I enjoy watching the contestants make positive shifts in their lives physically in their weight loss, but I totally love how it also employs how mental obstacles are what are usually keep us down. It’s inspirational, and I won’t falter in saying that it was a Biggest Loser elimination speech some 5ish years ago that helped me make the decision to move on from the dead-end relationship i was in back then. Chris Powell is totally motivational, and very much professional with a good splash of empathy. A big heart definitely comes into play as well. The season felt way too short, but when you’re working with 6ish people around the country over the course of a year and spending the first 3 months living with the individuals…it’ll take a while to put together lol. My favorite transformation was the gentleman shown above. Definitely a hard worker AND a Brave’s fan, nice! It doesn’t hurt that Chris Powell is adorable too. Killer dimples with a slight smirk when he smiles. Big open eyes that definitely have a passion for what he does. A little squeak to his voice that I can’t help but to mimic and squeal over when I hear. Not to mention his physical fitness is awesome. He’s small-framed like me and I can only hope to get there at some point. Still trying to gain weight to get there though! Around 125 and shooting for 130ish, then I can start cutting back down and looking great! 1. Love In the Wild – This show was the biggest surprise to me as I thought it was going to be a cheap knock-off dating show. And I mean, it was definitely low budget but it came with a really big overlay of heart. Seeing the previews, I knew I wanted to give it a go because I not only wanted to check out the guys (of course), but with the situations/tasks they were put through out in the middle of Costa Rica, I knew there would be alot more “real” interactions between the couples in search for love amongst themselves. Welcome to a little bit of me. I'm Ste, a gay boi from the Nashville area of TN, and I just want to use this as a means to talk about things that interest me or that stir just a bit of thought. I enjoy reality tv, writing, gaming, and Oakland A's baseball!. ^^ Thanks for visiting!